A timeline of Carter Page’s contacts with Russia. The Trump campaign adviser’s foreign dalliances, explained. 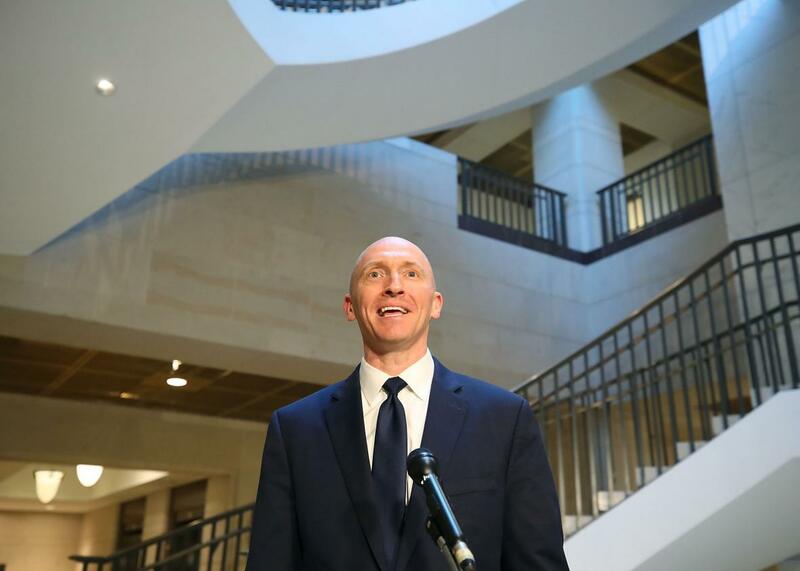 Carter Page, former a foreign policy adviser for the Trump campaign, speaks to the media after testifying before the House Intelligence Committee on Thursday. Last Thursday, Carter Page testified before a closed-door session of the House Intelligence Committee for more than five hours, admitting that he met with Russian officials while traveling to Moscow in July 2016. Page’s admission represents a reversal of his consistent denials over the past year. This timeline delineates key events in Carter Page’s connections to Russia before, during, and after the Trump campaign. 2004 to 2007. According to Page’s biography on the website of Global Energy Capital, his venture capital firm, he served as a vice president at the Merrill Lynch office in Moscow and remained there for three years. The bio adds that Page served as an adviser “on key transactions for Gazprom, RAO UES and others.” Page told Bloomberg News in March 2016 that he advised Russian energy giant Gazprom as it was buying a stake in a lucrative Russian Far East oil and gas project called Sakhalin II. However, Politico later reported that the CEO of Sakhalin Energy, who negotiated with Gazprom on the deal, said that he didn’t know anyone named Carter Page and did not believe Merrill Lynch was involved with front-line deal negotiations at all, because the negotiations were political and done at the CEO level, with Putin himself giving the final approval. January to June 2013. Page meets and gives documents relating to U.S. sanctions against Russia to Victor Podobnyy, an alleged Russian intelligence operative in New York City. Page provides documents to him from January to June. Podobnyy served as an operative for Russia’s external intelligence agency while officially claiming to work at Moscow’s U.N. Mission in New York, although Page believed he was a Russian businessman. Page later told BuzzFeed that their interactions did not include anything sensitive. Court documents show that Podobnyy tried to recruit Page (“Male-1”) “as an intelligence source.” Pobodnyy did not seem impressed with Page, labeling him an “idiot,” but one whose eagerness to garner lots of money could make him useful. Podobnyy claimed to have offered to connect Page with Russian trade representatives in exchange for documents about U.S. sanctions against Russia. Podobnyy: [Page] wrote that he is sorry, he went to Moscow and forgot to check his inbox, but he wants to meet when he gets back. I think he is an idiot and forgot who I am. Plus he writes to me in Russian [to] practice the language. He flies to Moscow more often than I do. He got hooked on Gazprom thinking that if they have a project, he could be rise up. Maybe he can. I don’t know, but it’s obvious that he wants to earn lots of money. Podobnyy: I did not even indicate that this [Podobnyy’s offer to connect Page with Trade Representatives] is connected to a government agency. This is intelligence method to cheat, how else to work with foreigners? You promise a favor for a favor. You get the documents from him and tell him to go ____ himself…This is ideal working method. Jan. 23, 2015. The U.S. government charges Podobnyy and two other Russian operatives for acting as unregistered agents of a foreign government, after it had broken up a Russian spy ring aimed at seeking information on U.S. sanctions. Federal prosecutors include the Russian intelligence effort to recruit Page as part of the government’s evidence. Early June 2016. At a closed-door foreign policy roundtable held for visiting Indian Prime Minister Narendra Modi, Page praises Putin as a stronger and more reliable leader than President Obama. He added that a Trump presidency would have a positive effective on U.S.-Russian relations. The meeting was held at Blair House in Washington. Weeks before Page’s trip to Russia. Then–Trump campaign manager Corey Lewandowski approves Page’s trip to Moscow on condition that he not act as an official representative of the campaign while there. Page initially asks J.D. Gordon, his supervisor on the national security team, who strongly advises against taking the trip. Then, Page emails Lewandowski and Trump campaign spokeswoman Hope Hicks for official approval, and Lewandowski approves. The Trump campaign would refuse to acknowledge whether it had approved Page’s trip for several months, until Politico broke the story. July 7 and 8, 2016. Carter Page gives a rambling speech and Q&A on “the future of the world economy” at the World Trade Center in Moscow. The next day, he gives the commencement address at the New Economic School in Moscow, criticizing U.S. policy toward Russia as too harsh. At both events, Page refuses to comment on whether he would meet with Russian officials. An intelligence dossier claims that while in Russia, Page met with Igor Sechin, a Putin ally and former Russian deputy prime minister who is now chief executive of Russian oil conglomerate Rosneft. The same dossier claims he also met Igor Diveykin, Putin’s deputy chief for internal policy, whom U.S. officials believe was responsible for Russian agencies’ intelligence-gathering about the 2016 election. According to the dossier, Diveykin told Page that he had compromising material on Hillary Clinton. July 20, 2016. Page meets with Russian Ambassador to the U.S. Sergey Kislyak at the Republican National Convention in Cleveland. Nevertheless, Page continually denied that he had met with any Russian officials during the campaign. Aug. 29, 2016. Sen. Minority Leader Harry Reid writes a letter to then–FBI Director James Comey calling for an investigation into evidence suggesting that Russia may try to manipulate the results of the 2016 election. In it, he indirectly refers to Page’s speech in Moscow criticizing U.S. sanctions policy toward Russia. Late summer 2016. The FBI obtains another secret court order from a Foreign Intelligence Surveillance Court judge to monitor Page’s communications, after convincing the judge that there was probable cause to believe Page was acting as an agent of a foreign power. The FBI waited until the Trump campaign had parted ways with Page to begin surveilling him. The FBI had previously surveilled Page in 2014. The bureau’s renewed interest in him in 2016 was sparked by concerns that Russian intelligence was targeting him for possible use as an asset. Sept. 23, 2016. Yahoo News reports that U.S. intelligence agencies are investigating whether Page engaged in private communications with senior Russian officials, including talks about a potential lifting of economic sanctions should Trump be elected president. The report adds that Page’s activities have been discussed with senior members of Congress during briefings about suspected Russian attempts to influence the election, and that Sen. Reid wrote his August letter to Comey after one of those briefings. He [Page] has no role. … We are not aware of any of his activities, past or present. He’s certainly not part of the campaign I’m running, meaning we don’t have him—we have a number of people, fabulous people, men and women, as part of our national security and foreign policy team. And he’s not among them at Trump Tower. If he’s doing that, he’s certainly not doing it with the permission or knowledge of the campaign, the activities that you described. … He is certainly not authorized to do that. He also writes that he has sold his “de minimis” stake in Russian energy giant Gazprom at a loss. Bloomberg News reported on Page’s “deep ties” to Gazprom in March, but a Politico account in September suggested Page exaggerated his contacts with Gazprom. Politico notes that when Page founded an investment fund called Global Energy Capital in 2008, former Gazprom executive Sergei Yatsenko served as a partner in the venture. Sept. 26, 2016. In his first public comments about accusations that he met with Russian officials, Page tells the Washington Post’s Josh Rogin: “All of these accusations are just complete garbage.” He adds: “All the ones that are mentioned in the various articles, I didn’t meet with any of those guys. … It’s completely false and inconceivable that someone would even accuse me of that.” Page admits, however, that he did briefly meet and shake hands with Russian Deputy Prime Minister Arkady Dvorkovich, a fellow speaker at the New Economic School commencement address. Dec. 8 to Dec. 13, 2016. Page visits Moscow again, telling state-operated RIA Novosti news service, “I am meeting with business leaders and thought leaders.” Kremlin spokesman Dmitry S. Peskov tells journalists that Russian officials had no plans to meet with Page and Russian Deputy Foreign Minister Sergei Ryabkov says that foreign ministry officials also had no plans to meet Page. In remarks posted to YouTube, Page says he had “the opportunity to meet with an executive from Rosneft,” the Russian oil giant, while in Moscow. Page tells the AP he was not referring to Igor Sechin, the Putin ally whom U.S. intelligence agencies believed Carter might have met with in July. I had no meetings, no meetings. … I might have said hello to a few people as they were walking by me at my graduation—the graduation speech that I gave in July, but no meetings. The interview comes on the heels of USA Today reporting that Page was one of two campaign officials other than Jeff Sessions who met with Kislyak. Page cites “confidentiality rules” in refusing to say what he discussed with Kislyak, adding: “I had no substantive discussions with him.” However, Page’s invocation of confidentiality rules suggests he is trying to protect the contents of substantive discussions at the Global Partners for Diplomacy conference in Cleveland, which took place during the 2016 Republican National Convention. March 3, 2017. In an interview with CNN’s Anderson Cooper, Page suggests he is unsure whether Russia ever interferes in the internal affairs of other countries, and offers as an alternative that the U.S. has interfered in the internal affairs of Ukraine. Cooper: Your legitimacy on this, your credibility on this does seem under question if you’re completely unwilling to look at anything Russia may or may not have done to even entertain the notion that Vladimir Putin would be capable—I mean I read some quote you read during your speech in Moscow and I wish I had it in front of me, basically it’s a quote by Vladimir Putin which says—here it is. He said, we never meddle in the internal political affairs of other countries, unlike the U.S., do you believe Vladimir Putin? Page: I think what he is saying—the point I was trying to make is that I don’t—I don’t—I’m not here—I made very clear that I was not there as part of the Trump camp—Trump campaign. Cooper: Do you believe that Russia meddles in the internal political affairs of other countries? Cooper: You don’t know anything about that? Cooper: You honestly can say—you have a PhD, right? You honestly can say about you don’t know anything about whether Russia meddles in the internal affairs of other countries? Cooper: Carter, you’re not making sense. Yes or no. You can just tell me, yeah, I do not believe that Russia ever meddles in the internal political affairs of other countries or yes, I believe they do. Page: —exactly. So, yeah, I think that’s a fair statement. Hayes: Were you guys on email chains together, you and Papadopoulos? Page: Look, there is a lot of emails all over the place when you’re in a campaign. Hayes: Were you in email chains with Papadopoulos? Page: Probably a few, yeah. Hayes: Were you on email chains with him about Russia? Page: It may have come up from time to time … again, y’know, there’s nothing … nothing major, yeah. Hayes: Well, I mean, nothing major. It was enough for him to lie to federal investigators about and then plead guilty to that he was having an intermediary come to him and say you should come to London and talk to someone who has Hillary Clinton’s e-mails. Nov. 2, 2017. The New York Times reports that Page, in testimony before the House Intelligence Committee, reveals he met with Russian officials during his July 2016 trip to Moscow. After those meetings, Page reportedly emailed at least one Trump campaign adviser to distill lessons he learned from his discussions with government officials, legislators, and businessmen. Page tells the Times in an interview following his testimony: “I had a very brief hello to a couple of people. That was it.” He adds that he met with one “senior person” but does not confirm that person’s identity. He also confirms that he wrote the email to the campaign. Page tells CNN in a post-testimony interview that in June 2016, he told Attorney General Jeff Sessions, who was then head of the Trump campaign national security team, that he was planning on traveling to Russia that July. He says he informed Sessions about the trip “in passing” following a group dinner meeting of campaign aides. It was the only time Page met Sessions. Page tells CNN the meeting was unrelated to his campaign role. Page invoked his Fifth Amendment rights when asked by the committee why he had not turned in documents relating to the probe into Russian interference in the 2016 election. “I’m helping to the greatest extent I can,” Page told reporters after the testimony.